This article, written by MGNV member Mary Free in December 2012, is worth a repeat. Appreciating the winter garden makes for a happier all-season gardener! For some excellent native tree suggestions you can explore the MGNV series of tried and true plants. Trees in particular can be found at Tried and True Plants/Trees: https://mgnv.org/plants/trees/. As annual flowers succumb to freezing temperatures and many perennials enter a dormant period, one green plant still covers the ground in the woodlands and shade gardens: Polystichum acrostichoides. Also known as Christmas fern, its graceful, finely textured fronds often are used as a seasonal decoration. 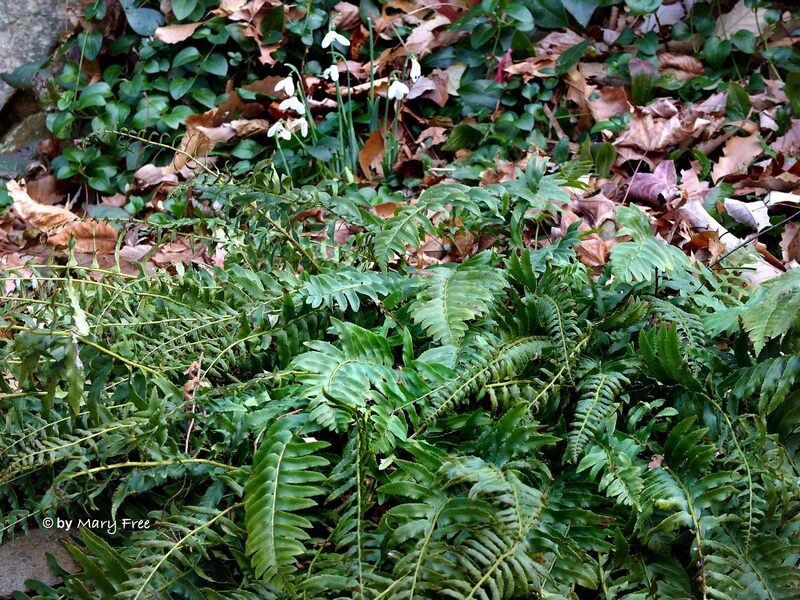 The demonstration Shade Garden in Arlington’s Bon Air Park displays a variety of native ferns including Polystichum acrostichoides shown in mid-December with Galanthus caucasius in the bloom in the background. © Mary Free. 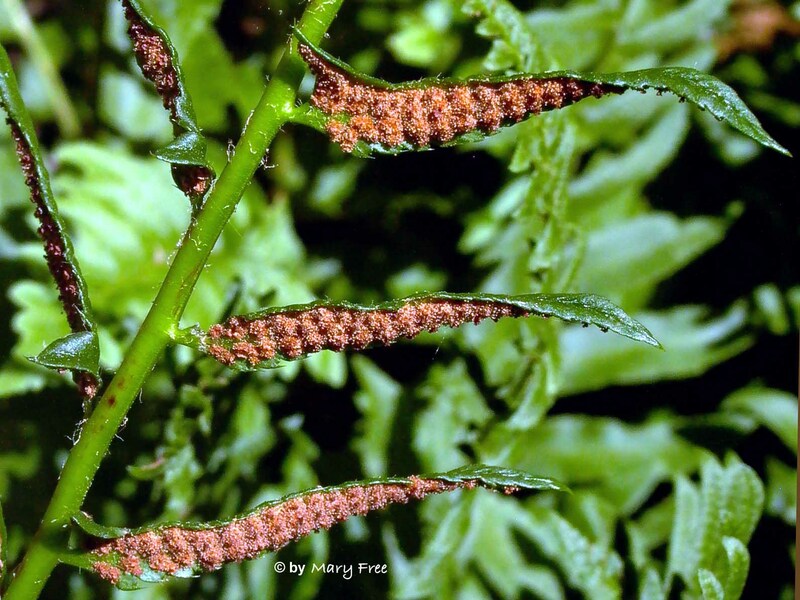 An eastern US native, Christmas fern grows in a circular clump with its arching fronds reaching 1’-2’ high and wide. Although it prefers part shade and moist, well-drained soil, it can tolerate more sun with enough moisture as well as drier soils in full-shade. 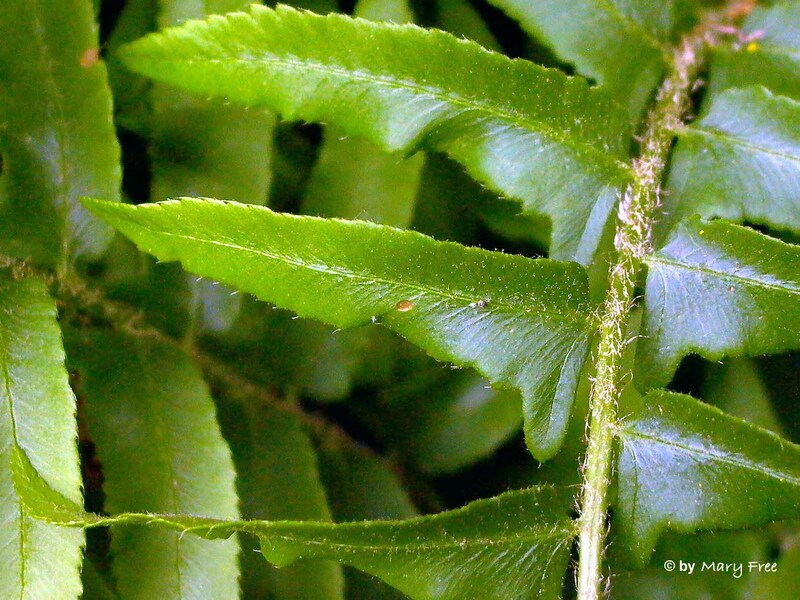 For year-round interest, grow this fairly low-maintenance fern in a woodland or Japanese garden, under trees, en masse, as contrast to shade bed perennials or for erosion control. 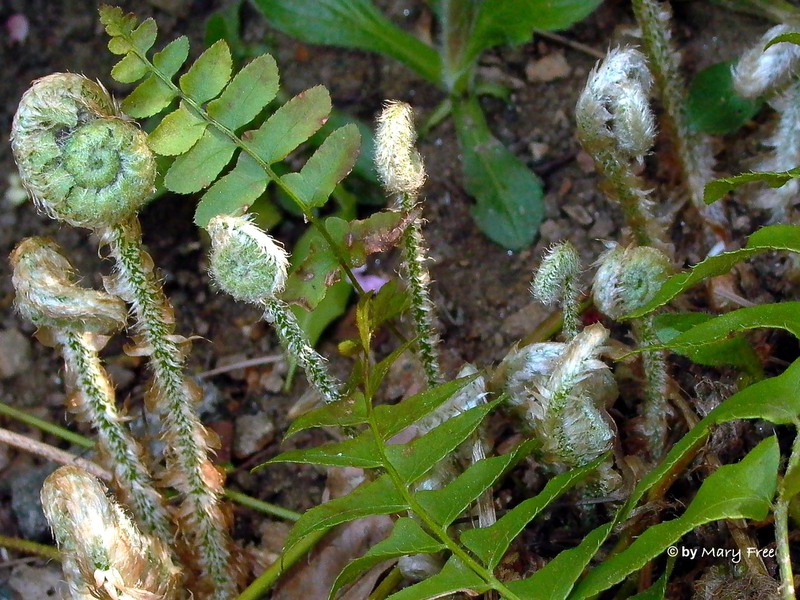 In early spring, new leaves or fronds emerge in the form of a tight spiral, shaped like a fiddlehead, amidst old fronds that remained evergreen through winter. © Mary Free. Expanding to reveal a sock or ear lobe shape with bristly, serrated edges, fronds age to a dark green. © Mary Free. Now that deciduous trees are bare (except for those, like some oaks, hornbeam and beech, with marcescent foliage—dead leaves that remain on the branches through winter), the conifers and hollies that were the backdrops of summer take center stage. Clothed in varied hues of green, their scaly, needlelike, smooth or glossy foliage is accented with cones or berries. However, do not dismiss so readily the defoliated deciduous tree or shrub. The aesthetic quality of its bark (as well as that of conifers) is often overlooked in favor of foliage, flower and fruit. Yet, for one quarter of the year or more, its bark and shape are on conspicuous display. Though a tree may exhibit its beauty through flower and foliage, its character is revealed with its bark. Who cannot marvel at bark and branches that are smooth or furrowed or peeling or shiny or colorful or mottled or striped or contorted? 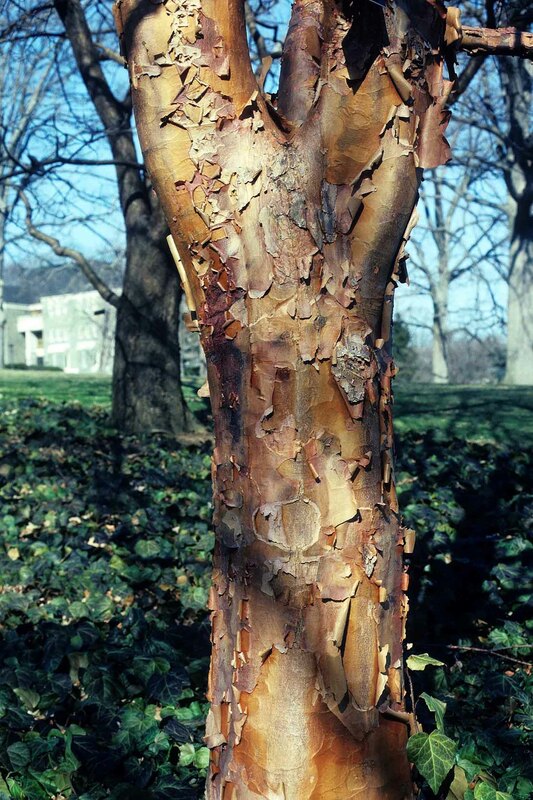 For a specimen tree prominently featured in the landscape, the quality of its bark may be especially important to ensure four-season interest. So when selecting a new tree for your property, in addition to a tree’s habit (cold-hardiness, heat and drought tolerance, size, rate of growth) and the site conditions (soil type and ph, moisture, sun/shade), be sure to take into account the texture, color and shape not only of its foliage and flowers but of its trunk and branches as well. 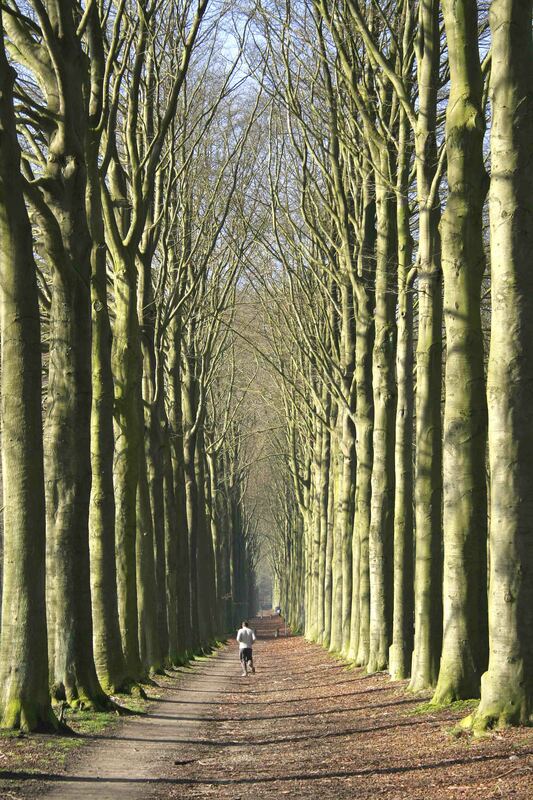 European beech trees in Mariemont, Belgium by Jean-Pol GRANDMONT, CC BY-SA 3.0 via Wikimedia Commons. • Those with peeling or flaking bark. 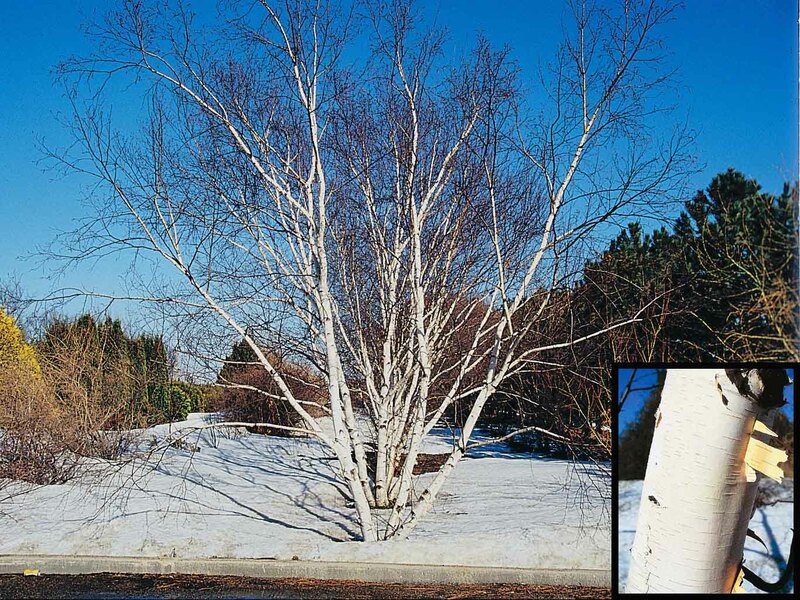 Natives: Betula nigra,* black birch (variable bark with some that exfoliate horizontally in curly sheets); Betula papyrifera, paper birch; Platanus occidentalis, American sycamore (camouflage-color bark that drops with regularity along with fruit and foliage); and Stewartia spp. Non-natives: Acer griseum, paperbark maple; Cornus kousa, Kousa dogwood; Stewartia pseudocamellia, Japanese stewartia (exfoliating older, gray bark reveals lighter patches of cream and orange underneath); and Pinus bungeana, lacebark pine (bark mottled in irregular patches of brown, rust, green and cream). Betula papyrifera courtesy USDA-NRCS PLANTS Database, Herman, D.E., et al. 1996, North Dakota tree handbook. Platanus occidentalis in summer in Fairlington, Virginia. © Mary Free. Acer griseum in winter at Scott Arboretum, Swarthmore, Pennsylvania. Copyright Chicago Botanic Garden 2009, Photograph by James Ault, CC BY-NC-SA at http://www.morphbank.net/. • Those with red/bronze stems/bark. Hybrid: Acer x conspicuum ‘Phoenix,’ Phoenix maple. Non-natives: Acer palmatum, Japanese maple (red twigs); Maackia amurensis, amur maackia; Pinus densiflora, Japanese red pine (orange-red stems and young bark peel in thin scales; older bark turns gray, developing plates); Prunus spp. (reddish to red-brown to bronze bark); Salix integra ‘Hakuro-nishiki,’ Japanese dappled willow (new stems turn red in winter); and Syringa reticulata (formerly S. amurensis japonica), Japanese tree lilac (shiny, cherry-like, reddish-brown bark). 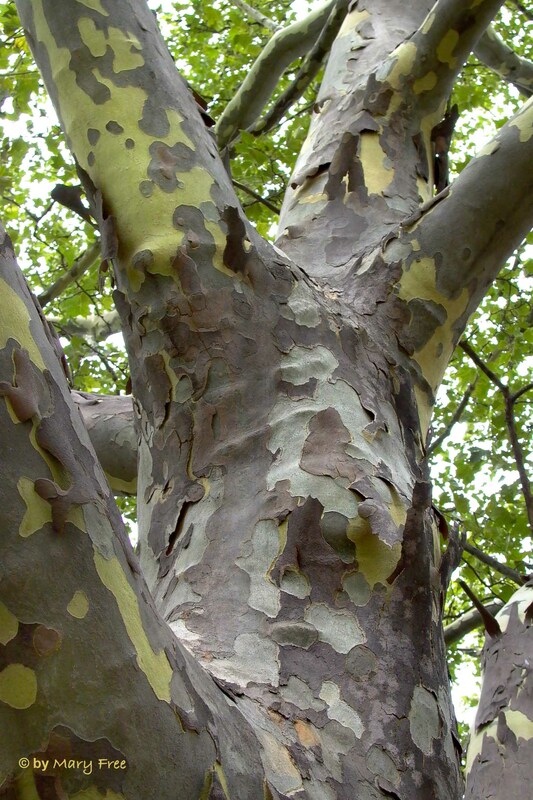 • Those with striped bark: Native: Acer pensylvanicum, striped maple (smooth, young bark gray-green with white longitudinal stripes; bark ages to a reddish-brown). Non-natives: Acer davidii, David maple (young branches turn red in winter; older bark shiny and green with purple-red highlights and jagged white lines) and Acer tegmentosum, manchustriped maple (striking white vertical stripes on light green bark, but susceptible to Nectria canker). Spring catkins on Corylus contorta in Fairlington, Virginia. © Mary Free. • Those with contorted shapes. Native: Acer circinatum, vine maple (greenish bark remains smooth even as tree ages; often covered with lichens). 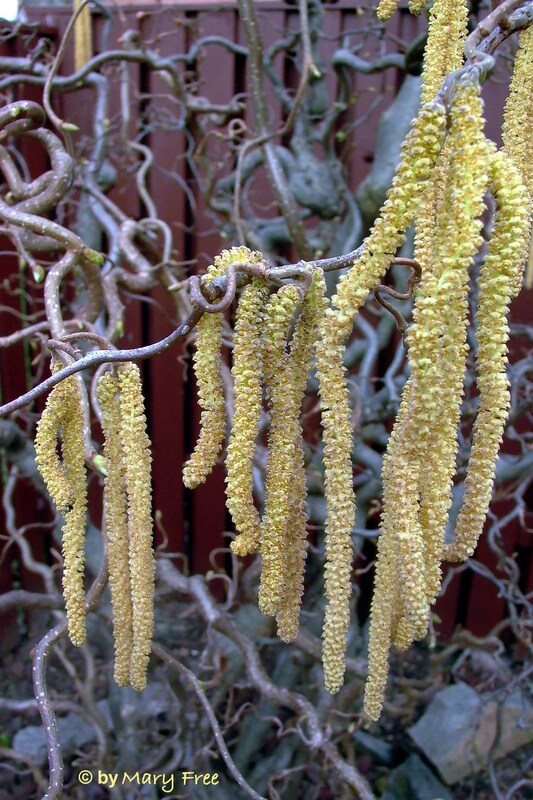 Non-native: Corylus contorta, Harry Lauder’s walking stick. So the next time you walk by a naked tree, stop and take a closer look. Just as flowers may tempt our noses, bark may tempt our tactile senses. You may be pleasantly surprised or even amazed by what you see and feel. * High wildlife value according to the U.S. Fish and Wildlife Service. 1. For more information: Selecting Landscape Plants: Rare and Unusual Trees, VT Publication 426-604 at http://pubs.ext.vt.edu/426/426-604/426-604.html. 2. 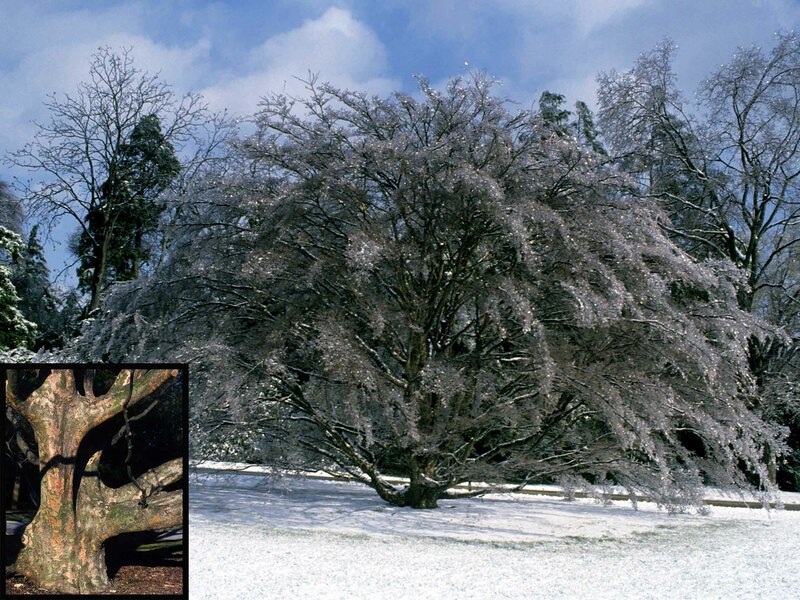 To identify a tree, visit: http://dendro.cnre.vt.edu/dendrology/idit.htm. 3. For native tree suggestions, visit Tried and True Plants/Trees: https://mgnv.org/plants/trees/. 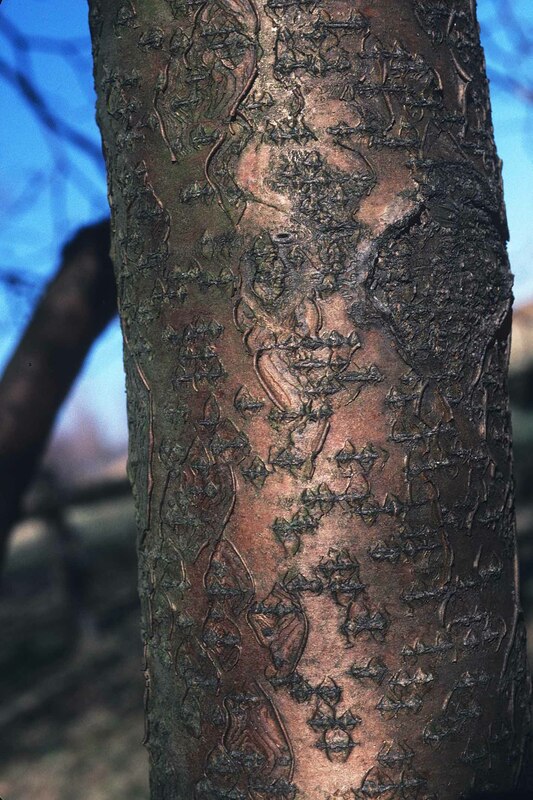 This entry was posted in MG in the Garden and tagged Acer circinatum, Acer davidii, Acer griseum, Acer palmatum, Acer pensylvanicum, Acer tegmentosum, Acer x conspicuum 'Phoneix', America beech, American hornbeam, American sycamore, amur macckia, bark, beech, Betula nigra, Betula papyrifera, black birch, black walnut, black walnut tree, carpinus caroliniana, Christmas fern, common persimmon, conifers, Cornus kousa, Corylus contorta, David maple, Diospyros virginiana, erosion control, European beech, fagus grandifolia, Fagus sylvatica, Hamamelis virginiana, Harry Lauder's walking stick, hollies, hornbeam, Japanese dappled willow, Japanese maple, Japanese red pine, Japanese stewartia, Japanese tree lilac, Juglans nigra, Kousa dogwood, lacebark pine, Maackia amurensis, manchustriped maple, Mary Free, native trees, Nectria canker, oaks, paper birch, paperbark maple, persimmon, Phoenix maple, Pinus bungeana, Pinus densiflora, platanys occidentalis, Polystichum acrostichoides, Prunus, S. amuerensis japonica, Salix integra 'Hakuro-nishiki', shade bed perennials, specimen plants, specimen trees, Stewartia, Stewartia pseudocamellia, striped maple, Syringa reticulata, tree bark, Tried and True Native Plant Selections for the Mid-Atlantic, US natives, VCE, vine maple, Virginia Tech, witch-hazel, woody plants. Bookmark the permalink.